After 13 busy years maintaining poly-stylistic sideman duties and long-distance collaborations with former Chicago comrades, Bruckmann finally busts out as bandleader of a Bay Area ensemble. Gleefully colliding elements of skronk, fried analog noise and dark prog within a Creative Music framework, DEGRADIENT adds a significant chunk of heavy to his signature gimmicks of jittery polyrhythmic clatter, formal complexity, black humor, and all-around sensory overload. The core quartet features fellow Chicago ex-pat Aram Shelton along with the in-demand rhythm section (currently driving groups including Jack O’ the Clock and the Fred Frith Trio) of Jason Hoopes and Jordan Glenn. 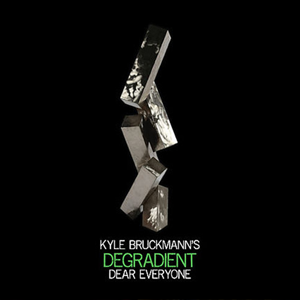 Dear Everyone takes its oblique inspiration from the recursive, encyclopedic poetry of Bruckmann’s friend Matt Shears. The book of the same name, published in 2016 by Brooklyn Arts Press, was pegged by early reviews as “pitched dead between thrilling and numbing” with “an absurdist, dark sense of humor.” Bruckmann spent months carrying around a recorder and a fistful of crumpled pages, shoving them into unsuspecting hands, asking friends and family for spontaneous, clumsy readings of fragments. In the end, 99 voices wound up in the cut-up stew. Guests include trombonist Weston Olencki (winner of the 2016 Kranichsteiner prize at Darmstadt, who has also worked with Wet Ink and Ensemble Pampelmousse), and volatile vocalists Theresa Wong, Danishta Rivero (Las Sucias, Voicehandler) and Eugene S. Robinson (Oxbow).